Thunderbird runs in the background and regularly synchronises e-mails. 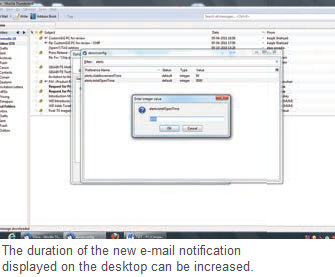 The new message alert displayed on the desktop appears for a short while, but it’s possible to increase the duration of the display. The new message alert displayed on the desktop appears for a short while and there are chances that it may be overlooked. You can increase the duration of the notification in few easy steps. Open the command ‘Tools’ and select the category ‘Options’. Then in the ‘General’ tab under ‘Advanced Configuration’ click on ‘Config Editor’. You will see a warning box, click on ‘I’ll be careful, I promise!’. Then from the list that you see, search for ‘alerts.totalOpenTime’ in the list and open it for processing it with a double click. The integer value describes the display time in milliseconds. Increase the value, for example to ‘10000’ for 10 seconds and confirm with ‘OK’. Close all the open dialogues. Due to the longer display time you can read the topics of the new messages and fi nd out, whether something is important.